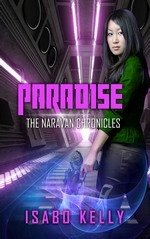 The Narvan Chronicles releases continue with PARADISE. This is shortish story that was written originally for an anthology exclusive to the RT Booklovers conference. So if you weren't at that conference to get a copy of the anthology, this is technically a new release. *grin* The story is easily stand alone and outside the main arch of the series so if this is your first foray into The Narvan chronicles you shouldn't be lost. Though some of the characters mentioned in passing in this story are from previous and/or future books. PARADISE is out for a limited time at $0.99 in ebook so now is the time to get it. It's also available in print, though that's still populating through the distribution channels so give it a week. (I'll up date the links when the book appears at the various sites). With chaos brewing in FarMore space stations biggest resort casino, Security Chief Meiling Trudeau will have to decide if she can trust the man she used to love—with the safety of her space station as well as her heart. 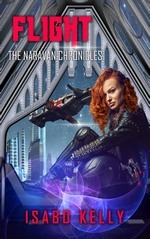 Next up in The Naravan Chronicles is FLIGHT. This will be a brand new, never before published book in the series, but the idea of FLIGHT has been lingering in my imagination for...oh probably eighteen years. LOL. So it's very exciting to finally have it coming out! It's due this fall, and based on the current production process, look for a mid-September release date. But keep checking back as I'll update that if anything changes. If you want to keep up-to-date on releases and news, please sign up to my mailing list here. (There's double opt-in and I never share your emails, so you're safe with me. *grin*) I'll also be sending out the occasional free short story to subscribers just because. One on the schedule for this summer was previously published in RT Magazine about 9 years ago when they were experimenting with publishing some fiction alongside their reviews and Romance news. Since RT is closing this year (so sad! ), it seems like a good time to show that story to an audience again. If you're not into joining newsletters, everything I give away on my mailing list will also eventually be released in ebook stores. Just check back here for updates. As summer is upon us up here in the northern hemisphere, happy warm summer day reading to everyone! And for those in the southern hemisphere, happy cuddling under a blanket winter reading!